The details from the recent trip to Nigeria are in. We are awed at the Lord's provision. We have reported in our last letter on the obvious fruit of prayer but did not report on the financial aspect. This is important. BFF often meets certain expenses and contributes to the different needs of the pastors. We reported lsat time that as the week progressed, more and more pastors attended the seminar. The person in charge thought it would be appropriate to keep offering a copy of The Godly Man (due to binding restraints, it was published in five volumes). In the advertisement for the seminar there was no charge for registration and each participant was offered a free copy of The Godly Man. It is very expensive to print matter in Nigeria. In this case the book cost about US$11 each. The average pastor often gets only $US20/month. Where are they going to get money to purchase good resources? The organizer went ahead and had more copies printed for all the attendees. BFF initially only provided enough for 100 copies but in the end, about 170 were printed. What about the rest? Praise the Lord! Two days ago the remaining sum was sent to cover the other 70 books. What we received for the short term came out just right for the need. This verse stood out like the sun in the sky when I read it for my devotional time. And God is able to make all grace abound to you, that always having all sufficiency in everything, you may have an abundance for every good deed; as it is written, "HE SCATTERED ABROAD, HE GAVE TO THE POOR, HIS RIGHTEOUSNESS ABIDES FOREVER" (2 Corinthians 9:8-9). You can see how this pastor's ministry, Spread the Word, really impacts the other pastors. At great cost to himself, he went ahead, in faith, to provide extra copies for them. My faith and devotion are always encouraged by these pastors and their ministries as I work along with them. The One God is Father of us all. Thanks to all who prayed and gave!!! Next Monday I will be interviewed on a local radio station, WORD FM 101.5. The host asked if I would bring anyone else along? I replied, "Probably not." Then I asked him whether or not they needed to speak. After saying no and mentioning a special place to sit for them, we decided to turn it into a homeschool special event. On the program we will discuss the website (Biblical Foundations for Freedom) and the recently published book, Principles and Practices for Biblical Parenting. Join in if you can but at least pray for us. I am still rather nervous speaking in public. It is much easier for me to hide behind book covers and web pages. You can try hearing https://wordfm.com on Monday. I do love to write for the Lord. He always keeps a continual flow (or rush) of ideas to write and talk about. The many icons on my desktop represent unfinished projects. Some of the work is done. It just needs to be translated into web pages which requires time to put links and proper paragraphing. The icons are piling up because I have not yet mastered the new Dreamweaver program. I have to spend hours studying how to do different things. Please pray for insight that my projects do not get too far behind. One example is simply adding our new book to the store. Is it five weeks now? We want to get it up and sell it at a discount from Amazon. I used the old program today to do it. Just the right amount of money came in for the Nigeria trip to cover all the needs! Praise Him! Thanks to all who prayed and gave!!! The NextStep retreat was great. 45 NextSteppers came and could learn from other mentors as well as spend quality time with them. Lakshman's heart surgery (in India) was successful. He should be out of the hospital now. Our family seems to be largely in full health again except for Linda's right knee. 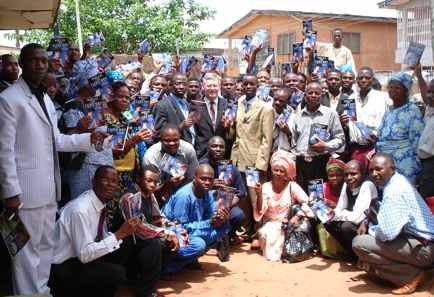 Please pray that God would continue to work this next month in Nigeria in a special way. Ask that the Lord would build up the faith of the hearers of the radio interview so that God's people would be strengthened. Pray that personal nervousness does not impede the message. June 7th our own church will have a Next Step training meeting. Pray for Pastor Hugo and I. I will speak on scheduling ( time management) and planning.